So I mentioned in my last post that I'm thinking of making hand-made games again. It's been a long time since I properly made hand-made games, so I thought I'd post on how I go about hand-crafting a game. 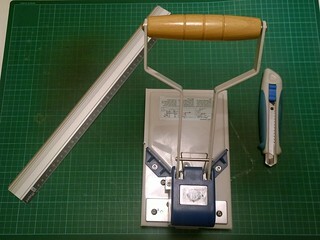 Before I can move to the next stage I need some tools - I use a craft knife with snap off blades and steel ruler (I've just bought a new ruler - a Maped Linea shown in the picture below about which I am very excited!) to cut out the cards. 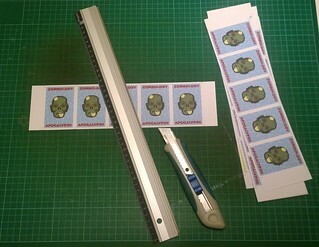 Although it's more work than a guillotine, I find it give me more precision, and doesn't kink the edge of the cards so much. The new ruler has three benefits over my old steel rule: a clearer scale for measuring, a non-slip backing and it's longer too. Also pictured is the corner rounding tool I bought back in my Reiver Games days. It can round the corners of a pile of cards that's about a centimetre deep, so you can quickly get through an entire deck. And that's how I make a hand-crafted game. There's a little more to it (making the box and the box wrappers) but I can cover that in another post. I've been thinking more and more about making games again and, in particular, returning to the glory days of Reiver Games when I made games by hand, selling out of print runs within a year. The first couple of years of Reiver Games were very successful by any margin - my print runs sold out and I doubled my stake each year. With the sudden influx of cash from my life insurance I was able to reconsider my position so I quit my job and starting trying to run Reiver Games as a real publisher. I spent a couple of years doing that full-time, not drawing a salary and publishing games professionally. The games were manufactured by professional companies and I started selling through shops and distributors. In many ways I continued to be successful, getting my games picked up by twenty-one distributors on three continents, and selling thousands of games. But the sales were coming in too slowly and I hadn't invested enough capital to make two simultaneous print runs, so when the second edition of It's Alive! was delayed at the manufacturers I took out a bank loan to fund Carpe Astra. The bank loan fees, along with the costs of warehousing my games, were such a constant drain on my finances for the next few years that I eventually ran out of cash. In hindsight I should have delayed Carpe Astra, it needed more work and ended up being the least successful of my games. The first couple of years of Reiver Games spanned July 2006-2008. Way before Kickstarter and the boom of social media. Many things have changed beyond recognition in the last eleven years. Not least my personal situation, I've gone from being a carefree young man to a father of one with another child on the way and from being a fit martial artist to having an incurable disease to being essentially healthy again thanks to a clinical trial of a new treatment. Clearly I'm unable to just give up my job for a laugh these days - so that is not an option. With a baby on the way I'll have very limited time around my full-time job to spend on running a company - I'll certainly not be making games that take three hours to construct by hand like I did with Border Reivers - my first game. I've learnt a lot about game design over that time, and I'm sure that both Zombology and the current version of Codename: Vacuum are better games than my other efforts (Border Reivers and Carpe Astra) and possibly even comparable to It's Alive!, the most successful game I published. I sold nearly 3,500 copies of that, so surely selling 100 copies of a hand-made run wouldn't be that difficult? 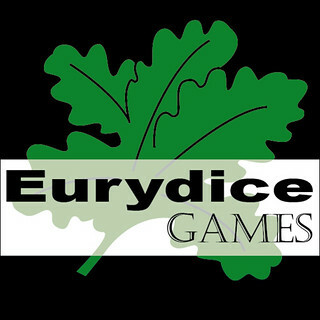 With all these changes, especially the changes in the marketplace that have occurred since Kickstarter overhauled the way games are made, I wonder whether there's still a market for small runs of hand-made games. The biggest problem I foresee would be how do I make people aware of my games? How do I be heard over the endless clamour of Kickstarter announcements? With a young family and a full-time job, I'll have very limited time for marketing activities and I'll not be shlepping round shops and cons like I did the first time round. What about me and my games will pique peoples' interest enough to get them to take an interest in (and possibly buy) my games? That's the question I would need to answer before I set things in motion. Any advice or help would be greatly appreciated! Last week was fairly busy, but I did manage to make it along to Newcastle Playtest after missing March (and possibly February?). It was a great night with a good turn out and plenty of games to try out. I ended up just playing my own games: initially a five player game of Zombology and then a three player game of Codename: Vacuum with Olly and Alex. 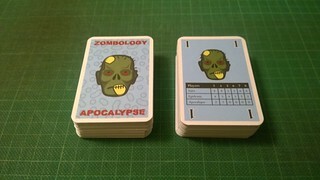 It was the first of two games of Zombology that week (we also had a three player game at the end of Games Night on Thursday) so I'm still slowly collecting the data I need to feel comfortable that the win/loss ratio is more or less where I want it in the new version and that it's well balanced across different numbers of players. I'm still considering a second hand-made run, though realistically this will have to wait until after the arrival of Daughter The Second at the end of May. Vacuum also went well. I tried out the fixed number of rounds for the first time and as a result it went a big longer - the three player game with two first timers probably lasted a couple of hours including rules explanation. It worked as expected, Olly choose an end game condition fairly early in round 11 which allowed Alex and I to both adjust our strategies mid-game. In the end all three of us scored within one point of the maximum in that category, so it didn't contribute meaningfully to the scores. 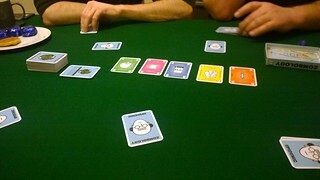 I chose in round 14, but that was still early enough for the others to catch up with my weak showing in that category. I'm still messing around with the end game and the scoring. I've had another idea over the weekend - allow each player to choose a (possibly non-unique) scoring condition and then score those conditions (possibly multiple times) at the end of the game. Maybe even give the person who chooses it a small bonus too (since they are giving up the chance to score more points in that category at the point when they choose it). This week I'm unlikely to get much done - today I'm off to Manchester for work again and then Thursday we head down to Bristol for a big family get together. I'm all set when we get back though, I've bought replacement inks for the broken cartridge which stopped me printing a new version of Vacuum in time for Playtest last week (which in hindsight was just as well as I now have more changes to incorporate). I've a load of work to do on the train this morning and probably this evening, but I'm hoping to tweak the Vacuum board before I get home. It's been a fairly busy week again, with loads of gaming, if not much design and playtesting. March has been my joint best month (with last May when I went Beer and Pretzels with Terry) since I was stuck at home on my own during my radioactive period in January 2014. And this week contributed a lot to that - we played Taluva a couple of times at lunchtime games club, then another six games at Games Night on Thursday - when we also had our joint best attendance. 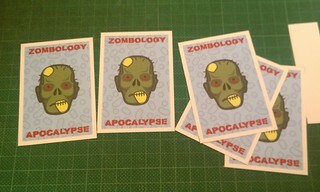 We also had a game of Zombology. It was the first recorded game with six players, so now I've got at least one data point for each number of players. In a perfect world I'd have tens or hundreds of plays for each number of players, currently I have between one and eight plays per number of players. Three and six are least represented and four is most. Clearly I still need a lot more plays. Finally, on Friday, a few of us ended up spending six hours on trains on the way to meetings in Manchester. We managed another eight games on those trains on my iPad. I also spent a little time one evening working on some improvements to the Codename: Vacuum cards that were required after the last couple of weeks' tests. 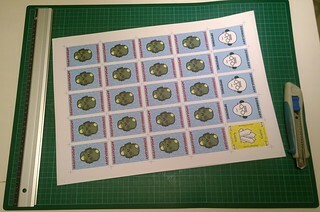 I intended to get those changes printed out over the weekend and cut out ready for Newcastle Playtest tomorrow. Sadly, the replacement ink cartridge I needed for my printer was broken so I couldn't print it out, let alone cut it out. I'll just have to take the last version along with me. I've missed the last couple of Playtests and obviously I'm going to struggle to make it along during the summer after the birth of daughter number two. I'm really looking forward to getting along tomorrow. Unfortunately, ahead of that I've got to have my other wisdom tooth removed tonight. The other one was taken out about a month ago, so I know what to expect. Tonight is going to be not much fun.